These were the words of the Iranian “moderate,” “pragmatic” former President Hashemi-Rafsanjani in December 2001, four years before the chilling declaration of Iran’s present President Mahmoud Ahmadinejad quoting Ayatollah Khomeini, the founder of the Islamic Republic: “Israel must be wiped out from the map of the world." While some cite an Israeli “threat” as the motivation for Iran's nuclear program, in fact Israeli leaders had never challenged Tehran before that program advanced, nor did Israel ever contribute to an armed attack on Iran. By contrast, the Iranian Mullahs have been clamoring for Israel's demise since the day they seized power in 1979. For Khomeini and his followers Israel is not only “the Small Satan,” an unnatural creature of Britain and the United States implanted on sacred Arab and Muslim soil, but also “the state of the infidel Jews who humiliates Islam, the Quran, the government of Islam and the nation of Islam.” Its destruction is therefore a sacred duty for every true Muslim. Using virulently antisemitic language, Ayatollah Khomeini regarded the Jews as an integral part of Western culture, the complete antithesis of Islamic culture, and its most dangerous ideological enemy. Khomeini claimed the Jews were preventing Islam from expanding worldwide. Since October 2005 Ahmadinejad has targeted Israel obsessively in his speeches, presenting his vision of a world without Israel or the United States. At the “World without Zionism” conference held in Tehran, Ahmadinejad portrayed Israel and Zionism as the spearhead of the West against the Islamic nation and emphasized the need to eradicate Israel. During the Islamic Conference Organization meeting in Mecca in December 2005, Ahmadinejad complained that since the West was responsible “for what some describe as the Holocaust,” no one should demand that the Palestinians pay the price. Ahmadinejad’s advocacy of Holocaust denial is but an intensification of prevalent themes in Islamic Iran’s ideological discourse. He seeks to restore the regime’s revolutionary goals and ideals and advance Iranian hegemony in the Middle East using anti-Zionism and Holocaust denial as principal pillars of his policy. Ahmadinejad is unique, not because he wishes Israel wiped off the face of the earth, but because he actively seeks to bring about an apocalyptic struggle between the righteous and the wicked to accelerate the return of the Mahdi or Hidden Imam. His threats are not merely rhetoric but represent a clear danger to the very existence of Israel, the only country targeted for a nuclear holocaust. Thus, the president of a rich, powerful country openly threatens to wipe Israel off the map, therefore completing the act that he claims did not happen in Europe. In the wake of the collapse of the Soviet Union and after its victory over Iraq in the first Gulf War, the United States emerged as the world's only superpower, determined to lay the foundations of a New World Order based on democratic and liberal values. One of its first moves toward the implementation of this new order was sponsoring the political peace process in the Middle East at the Madrid Conference in October 1991. Iran perceived the peace process as a threat to its ideological and strategic interests. A peace agreement would entail recognition of Israel as a legitimate state in the Middle East; it would consolidate moderate Arab regimes but endanger radical Islamic allied movements such as Hizballah and lead to the isolation of Iran regionally as well as ideologically. Iran immediately convened a conference in Tehran, parallel to the Madrid event, reuniting all terrorist and radical organizations that were hostile to negotiations with Israel and were ready to continue the struggle under Iranian leadership. At the close of the conference, the regime made the strategic decision to support the “Palestinian resistance” on the humanitarian, financial, political and military level. The struggle in support of Palestine is thus one of the few areas where Iran’s ideological/revolutionary goals overlap its national/pragmatic interests. The decisions taken at that conference continue to be implemented today and explain the massive Iranian support, both direct and indirect, for the various Palestinian terrorist organizations. The ideological hatred to Israel is also a convenient tool with which Iran can strategically bridge the gap between itself as non-Arab and Shiite with the rest of the Arab and Sunni Muslim world. For the last 15 years Iran has been the leader, the engine of an “axis of destabilization” of the Middle East, which includes Syria, the Lebanese Hizballah and the Palestinian Hamas. Iran is the conductor of the “quartet” because it is a major regional power with a decided leadership, a regional hegemonic vision, huge oil resources, a large army, an advanced military industry, and above all on the point to become the ninth nuclear power in the world. On the anti-Jewish front, the Iranian attitude has been more cautious. Thus Iran has preferred to strike covertly, through its proxies. Hizballah operatives, with the support of Iran’s intelligence network, carried out the bombing of the Jewish Community Center (AMIA) building in Buenos Aires, Argentina, on 18 July 1994, killing 85 persons and wounding 151. On 25 October 2006, Argentinean Attorney General Dr. Alberto Nisman, presented the report of the special investigating team which proved unequivocally that the decision to blow up the building was taken by the “highest instances of the Iranian government” and that the Iranians had asked Hizballah, to carry out the attack. It is noteworthy that according to the Argentinean prosecutors, the AMIA bombing was also intended to “punish” Argentina for President Carlos Menem’s decision to cancel the nuclear cooperation agreement with Iran. The last two prime ministers, Ariel Sharon and Ehud Olmert, adopted a "low profile" approach and reiterated that "Iran is an international problem, not an Israeli one." At the basis of this policy lay the assumption that Iranian nuclear arms would endanger not only Israel but the entire Middle East and the world, and a loud Israeli policy might turn into a bilateral confrontation between Iran and Israel and release world powers and the international community from their responsibility of dealing with the threat. After 20 years of futile diplomatic dialogue and a year of mild international sanctions the U.S., the international community, and first and foremost Israel, face a daunting decision: how to prevent Iran from going nuclear. Three options remain: severe economic sanctions; a military operation against the Iranian nuclear facilities; laissez faire – letting the Iranians achieve their goal and devising an efficient deterrent strategy for the future. Israeli politicians, military and academic experts all agree that a nuclear Iran would dramatically change the regional strategic balance, diminish the deterrent power of Israel, strengthen the most radical states and movements and provoke a disastrous nuclear proliferation in the Middle East. However, they vary in their views about the Israeli strategy of preventing Iran’s nuclearization and on the question of whether Israel could deter the Tehran regime from a nuclear strike in case Iran obtains the weapon. Israeli Prime Minister Ehud Olmert also discussed how to tighten sanctions on Iran with Stuart Levey, the U.S. Treasury's undersecretary for terrorism and financial intelligence. Israel is helping the United States identify firms that do business with Iran and track Iranian funding for nuclear and terrorist activities. The US government indeed instituted new unilateral sanctions against Iran by the end of October 2007 directed against the elite al-Quds Brigade of the Revolutionary Guards, and against certain financial institutions dealing with them. Regarding the international community, the sanctions have a dual purpose: to calm fears that the U.S. is trigger-happy and is prepared to take a step that would prevent the need for a military attack; at the same time it is also sending a warning to Europe and Russia: if they don't join, Iran will not feel the economic pressure, subsequently Iran will continue its nuclear project and the U.S. will be forced to use military force. Israel also is carrying a stick of its own to stimulate the Western powers into action. Israeli officials have warned time and again that if international sanctions fail, Israel might act on its own and launch a pre-emptive strike on Iran's nuclear facilities. In spite of the growing economic pressure, President Ahmadinejad declared that Iran will not abandon its atomic goals because of UN sanction resolutions that are "just a pile of papers.” He vowed to continue ignoring UN Security Council resolutions claiming that "the Iranian nation could not care less" about two rounds of sanctions that had been imposed. The low profile approach, according to the Israeli moderate leftist daily Haaretz, was reasonable as long as the international community seemed to rally behind the diplomatic efforts against Iran. Under these circumstances there is no longer any reason for Israel to whisper in the hope that "the world" will deal with the problem. Israel must clarify its concerns in a loud voice, as well as its determination not to live under the shadow of an Iranian nuclear threat. The Project Daniel group of six Israeli and American experts advised former prime minister Ariel Sharon on how to deal with Iranian nuclear weapons. Their report, Israel's Strategic Future, urged the prime minister to enhance Israel's deterrence and defense postures, to consider an end to deliberate nuclear ambiguity in certain situations, and to refine pertinent preemption options. Under no circumstances, the group concluded, should Israel entertain any hope of coexisting long-term with a nuclear Iran. Israel's core plan for active defense against future Iranian nuclear missiles remains the Arrow anti-ballistic missile program. Although this plan is sound as part of a much broader security strategy, it wouldn't suffice in the case of a nuclear Iran because ballistic missile defense (BMD) could not attain a 100% level of reliability. Therefore, the six experts advised to improve the Israeli deterrence and begin corollary preparations for defensive first strikes against relevant Iranian hard targets. 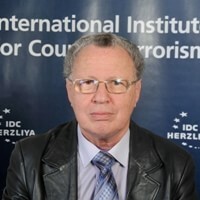 Efraim Sneh - a well-respected expert on defense and diplomatic affairs who as deputy defense minister under Ehud Barak from 1999 until 2001 and under the former defense minister Amir Peretz in 2006 was in charge of the Iran dossier - claims that contrary to public thinking Israel is not on a collision course with Iran; the two have already collided. "We have to forecast more cycles of confrontation with those Iran is unleashing against Israel," Hamas and Islamic Jihad in Gaza and the West Bank, Hizballah in Lebanon and Syria. For Sneh military action is not the preferred option but the final choice after the option of serious economic sanctions has been exhausted. According to Sneh, for an Israeli operation against Iran to be possible two basic conditions must be met: effective protection of the home front against thousands of missiles and rockets, some capable of carrying warheads with chemical payloads; and Israeli technological means and long-range operational capabilities. Therefore, the time for taking decisions against the Iranian nuclear threat will probably be during the tenure of the next government while the current government has no right of stripping future governments of the ability to act. The practical negation, or significant delay, of the Israeli option for action may have existential implications for Israel. Aluf Benn, a senior Israeli political journalist, has lately described the assessment of the situation at the top diplomatic and military levels in Israel: Iran is moving, unhindered, toward a nuclear bomb; blocking it with economic sanctions has failed, mainly because Russia, Germany and Italy refuse to stop doing business with the Iranians. The perception of the timetable is also different: Israel considers "the point of no return" in the Iranian nuclear program as "crossing of the technological threshold," the knowledge of how to produce nuclear weapons and replicate it even if the existing installations are destroyed. The American red line is the more distant date, when Iran has an operational bomb. Israel has declared in every possible language that it will see a military nuclear device in the hands of a hostile Iran as a red line. Iran has heard this and thus far has not been moved. If so, a confrontation between the two countries is inevitable unless it is preempted by American action. According to senior military analyst Amir Oren, Israel is hoping for an American operation, but is prepared to assume that Washington will ultimately not have the nerve to opt for one. The challenge is complex: the physical area of Iran is like that of Germany, France and Britain combined. Compared to this difficulty, the sortie made in 1981 against a single, above-ground target is dwarfed. A mission would be complex, but not impossible, and - in the opinion of a clear majority at the top of the defense establishment - essential. In January 2007, the British Sunday Times citing unnamed Israeli military sources even claimed that Israel is training pilots for a tactical nuclear strike against three Iranian nuclear sites. However, most informed Israelis were skeptical about this report. That said, Prime Minister Ehud Olmert was lambasted for being similarly rash in virtually acknowledging his country's nuclear capability a few weeks earlier. The Project Daniel group estimated that a possible Israeli-Iranian "balance of terror" should not be compared to US-Soviet deterrence during the Cold War. A presumed balance with Iran could never assure the required rationality of decision-makers in Tehran. Moreover, terrorist proxies instead of missiles could deliver Iranian nuclear weapons and materials. Israel cannot fully depend upon its anti-ballistic missiles to defend against any future WMD attack from Iran any more than it can rely only on its presumed nuclear deterrence. To be deterred, a rational Iranian adversary would need to calculate that Israel's reported second-strike forces are substantially invulnerable to any first-strike aggressions. If Iran should be allowed to become nuclear, Israel would have to fully enhance the credibility of its presumed nuclear deterrent and deploy a recognizable second-strike force, adequately hardened, multiplied and fashioned to inflict a decisive retaliatory blow against selected enemy cities. Ephraim Kam, Deputy Director of the Israeli think tank Institute for National Strategic Studies believes Israel can live with a nuclear Iran. Certain conditions may help reduce the Iranian threat and the uncertainty it contains: credible intelligence that Iran is not planning to use its nuclear weaponry against Israel; obtaining a clear American obligation to retaliate against Iran with a nuclear strike should Iran use nuclear weapons against Israel; arriving at an assessment based on credible indicators that Israel's strategic capability effectively deters Iran from the use of nuclear weapons; seeing more moderate officials join the circle of decision-makers in Iran. However, if Iran obtains nuclear weapons, this would compel Israel to build up a stable deterrent capability against Iran, which will prevent the unintentional deterioration to nuclear confrontation. As there are no accepted rules of behavior in a nuclear environment between Israel and Iran, no communication and no dialogue, such uncertainty is liable to increase the risks of miscalculation, overreaction, escalation of crises, and difficulty stopping deterioration in time. Thus Israel will have a critical need to try to build channels of direct communication with Iran, even if indirect, possibly via European governments. According to Kam’s optimistic view, these channels of communication could allow fostering rules of the game and pursuing confidence building measures in a nuclear environment and help guard against nuclear deterioration. Iran’s nuclear weapons could be controlled by some of the most radical elements in the regime and some of these weapons might even find their way into the hands of terrorists. The Iranian response to threats of serious sanctions and hints of military action are loud and clear. Ahmadinejad said recently that “those who assume that decaying methods such as psychological war, political propaganda and the so-called economic sanctions would work and prevent Iran's fast drive toward progress are mistaken." He issued a tough warning to any country considering an attack on Iran. Iran has indeed a wide range of options for retaliation at its disposal, as openly suggested by its political and military leaders. The most plausible scenario includes an immediate Iranian missile counterattack on Israel. Iran possesses up to 500 Shihab ballistic missiles of different types, with ranges varying from 300 to 2,000 kilometres; the missiles are capable of carrying warheads of up to 1,000 kg. Hizballah will be the main tool for attacking Israeli territory with rockets and guerrilla commandos, in spite of bland denials by its leaders. Iran and Syria have rearmed it with long-range missiles and Nasrallah boasted that Hizballah now has 20,000 rockets. Iran can target Israeli and Jewish targets abroad, as it did in 1992 and 1994 inBuenos Aires, Argentina. As for the Palestinians, Khaled Meshal declared that "if Israel attacks Iran, then Hamas will widen and increase its confrontation of Israelis inside Palestine." Tehran has other cards in its hands that could influence negatively Israeli strategic, political and economic interests in the region. One of the strongest cards is Iran’s capacity for damaging U.S. interests by wreaking havoc in Iraq; this would hasten the withdrawal of American troops and thus strengthen Iran’s hegemonic position in the Middle East and the destabilization influence of its radical allies. Iran can retaliate against energy targets in the Gulf and attack the flow of oil through the Strait of Hormuz. Consequently, oil prices would increase dramatically and profit countries that don’t support Israel or are its enemies. Moreover, Israel will be accused of the world energy crisis by poor and rich countries alike, as happened in the 1972-73 oil crisis. An Israeli attack on Iran’s nuclear sites could even further enhance the appeal of extremism in the Muslim world against Israel. However, Israel’s air raid on Syria on September 6, 2007, has broken the immunity of the Damascus regime without provoking a European or Arab outcry and it also showed Iran and the world that if Israel does act against a clear and present danger, the Muslim world will not erupt. According to Benn, Syria’s lack of response to the Israeli bombing of its territory could mean that Iran also will find it hard to respond, beyond launching “some missiles at Israel plus Hezbollah rockets from Lebanon, and perhaps a terror attack on an Israeli target abroad,” “a justified price for getting rid of an existential threat.” The international silence that greeted the action in Syria could be interpreted as encouragement of Israeli muscle-flexing. The European countries seem to prefer that Israel attacks the Iranian nuclear facilities and then condemn it, as they did after the bombing of Iraq’s Osirak reactor in 1981. On the one hand they will get rid of the Iranian threat on the other hand Israel will be the one to be blamed for consequences of the attack. There is no happy end in sight! During a speech on October 17, 2007 U.S. President George W. Bush warned in language unprecedented in its bluntness that nuclear weapons in Iran's hands might lead to "World War III." Bush's statements placed the threat to Israel at the top of the priority list for blocking Iran's nuclear program. If the international community and the great powers will not be able to reach a consensus on enhanced and severe sanctions; if such sanctions will however be decided and implemented but will not deter the Iranian leadership from continuing its nuclear program; and if in this eventuality the United States will decide not to strike at the Iranian nuclear facilities, Israel will stand alone against the threat. The Holocaust anguish will be a powerful psychological factor in the Israeli decision-makers’ considerations regarding the Iranian nuclear threat. Efraim Sneh stressed that one of the central lessons of the Holocaust is that Israelis should not ignore the mix of hatred of Jews and enormous military power. Israel cannot reconcile with the notion that a regime ideologically committed to its destruction will hold nuclear weapons. The Mossad head Meir Dagan, who coordinates Israel’s activities against the Iranian nuclear project, “is suffused with the memory of the Holocaust, which is memorialized in his offices by a bleak family picture.” Israel’s Air Force commander Gen. Elyezer Shkedy, who is also the child of Holocaust survivors, resembles him. Somewhere in the spring of 2008 the Israeli government will face a daunting decision: to strike at what great part of its politicians, military and citizens consider an existential threat, taking into consideration the tremendous implications of such an action, or to gamble on a possible deterrent arrangement with a future nuclear Iran. The Annapolis November 27, 2007 meeting was a political success for the Bush administration, as it brought nearly fifty nations together in support of Arab-Israeli peace and set up a mechanism for Palestinian-Israeli peace talks. Syria's presence at Annapolis, intended primarily to emphasize its agenda on the Golan Heights, was quite a surprise. Possibly, the September 6, 2007 Israeli air attack against the presumed Syrian "nuclear facility" has shaken the Damascus confidence in the Iranian invincibility on the nuclear front. Probably the main goal of Annapolis was to counter Iran's aggressive bid for regional hegemony and undermine its bid at becoming a nuclear power by strengthening the coalition of moderate Sunni Arab states. In this sense Annapolis was a setback for Iran, especially on the background of Syria’s participation. If these are the good news, the bad news is the latest US National Intelligence Estimate (NIE) released December 3, which judged “with high confidence that in fall 2003, Tehran halted its nuclear weapons program..." This assertion was immediately highlighted by all the major media worldwide without a thorough analysis of the contradictory information it contained, which does not take much into account the Iranian advanced civil uranium enrichment project and the long-range missiles program. Many analysts have dissected and refuted the report’s conclusion; leading members of Congress are "not convinced" by it; French and German leaders rebuffed it, and British intelligence believe its American counterparts were deceived by the Iranians. Israeli Defense Minister Ehud Barak asserted that Iran may have halted its nuclear weapons program in 2003 but had probably since restarted it. Foreign Minister Tzipi Livni said at a conference of NATO ministries in Brussels that she had no doubt that Iran continues to pursue its attainment of nuclear weapons. Most analysts believe that the report will close any military option for the Bush administration and even weaken international support for tougher sanctions against Iran. Worse, the NIE has sent a signal to the Tehran leadership that the danger of external sanctions has ended, and that it can go about its nuclear project undisturbed. Nevertheless, the White House claimed the estimate showed that suspicions about Iran’s intentions were warranted, given that it had a weapons program in the first place and that international sanctions worked and therefore should be enhanced. Future developments will tell if this criticized report will continue to influence the strategic decisions of President Bush or his successor. Against this background Israel is even more isolated than before and if Israeli intelligence will conclude that the threat is far more imminent than that perceived by the US, the Israeli leaders will bear the burden of the crucial decision of how to act. As a consequence of this declaration UN Secretary-General Kofi Annan canceled his forthcoming trip to Tehran after the Iranian president's declaration. "The secretary-general and the Iranian government have mutually agreed that this is not an appropriate time for him to travel to Iran," UN spokesman Stephane Dujarric said. Haaretz, November 5, 2005. As stated by Khomeini in a speech given on 19 Feb. 1978 at Najaf, a year before his advent to power. Cited by Amnon Nezer in The Monthly Review, Israeli Ministry of Defense Publications, Tel-Aviv (in Hebrew), March 1988, pp. 15-38. Interview with Meir Litvak, “Post-Holocaust and Antisemitism. The Development of Arab Antisemitism,” Jerusalem Center for Public Affairs, No. 5, February 2, 2003, at http://www.jcpa.org/phas/phas-5.htm. Ely Karmon, “International Terror and Antisemitism − Two Modern Day Curses: Is there a Connection?” The Stephen Roth Institute for the Study of Contemporary Antisemitism and Racism, TelAvivUniversity, February 2007, at http://antisemitism.tau.ac.il/asw2005/karmon.html. Meir Litvak, “What Is behind Iran’s Advocacy of Holocaust Denial?” The Center for Iranian Studies (CIS), TelAvivUniversity, Iranian Pulse No. 3, September 2006. Michael Burleigh, “The Iranian who wants an apocalypse,” Daily Telegraph, January 5, 2007. Waller R. Newell, “Why Is Ahmadinejad Smiling? The Intellectual Sources of His Apocalyptic Vision,” Weekly Standard 5, October 16, 2006. Elie Rekhess, “The Terrorist Connection − Iran, the Islamic Jihad and Hamas,” Justice (Tel Aviv), May 1995, p. 4. Ely Karmon, “Iran–Syria-Hizballah–Hamas: A Coalition against Nature. Why does it Work?” monograph forthcoming at the Proteus Monograph Series Fellows Program (PMSFP), Center for Strategic Leadership, U.S. Army War College, USA. 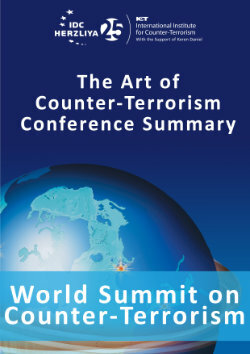 Ely Karmon, “The Axis of Destabilization of the Middle East,” Institute for Counter-Terrorism website, July 18,2006, at http://www.ictconference.org/s119/ apage/ 2803.php. “Iran says U.N. decisions on atomic plans worthless,” Reuters, October 24, 2007. “Argentina accuses Iran of responsibility for the Hizballah terrorist attack which destroyed the Jewish Community Center in Buenos Aires, 1994,” Intelligence and Terrorism Information Center at the Center for Special Studies (CSS), November 14, 2006, at http://www.intelligence.org.il/eng/ eng_n/html/argentina _amia_e.htm. Yaakov Katz, “Iran is the driving force behind global terror,” The Jerusalem Post, July. 5, 2007. “It's time to shout it out,” Haaretz Editorial, October 21, 2007. About eight states are in the process of divestment, Florida just passed a divestment bill and California Governor Schwarzenegger promised to get such a bill to his table. See Amir Mizroch, “Netanyahu: Squeeze Iran with sanctions,” The Jerusalem Post, September 10, 2007. “Israel, US Discuss Iran Sanctions,” VOA News, March 5 2007. Matthew Levitt, “Iran Sanctions: Can They Be Effective?” PolicyWatch, No. 1297, Washington Institute for Near East Policy, October 25, 2007. Yossi Melman, What effect if any will the new U.S. sanctions have on Iran? Haaretz, October 25, 2007. Robert Berger, “Israel, US Discuss Tightening Iran Sanctions,” GlobalSecurity.org, March 4, 2007. David Byers, “Iran 'could have atom bomb in a year',” Times Online, November 7, 2007. By this he confirmed the evaluation of the Mossad head Meir Dagan, who told the Knesset's Foreign Affairs and Defense Committee in December 2006 that Iran has intensified efforts to enrich uranium and has set a goal of getting 3,000 centrifuges spinning by the end of 2007. See Yaakov Katz, “Sanctions on Iran - too little, too late for Israel 's security establishment,” The Jerusalem Post, December 23, 2006. “Israel’s Strategic Future. The Final Report of Project Daniel,” NATIV Online, Vol. 3, April 2004, at http://www.acpr.org.il/ENGLISH-NATIV/03-ISSUE/daniel-3.htm. Project Daniel is a private and informed effort to identify the overriding existential threats to Israel and their prospective remedies. The result of this effort is conveyed in the Final Report: Israel's Strategic Future. Louis René Beres and Isaac Ben-Israel, “Think 'anticipatory self-defense',” The Jerusalem Post, October 22, 2007. The authors are two of the six Israeli and American members of the Project Daniel Group. Yaakov Katz, “Iran is the driving force behind global terror,” The Jerusalem Post, July 5, 2007. Aluf Benn, “From Israel, it looks different,” Haaretz, October 19, 2007. Amir Oren, “Complex, but not impossible,” Haaretz, October 18, 2007. “Israel and Iran. How imminent or real a threat?” The Economist, January 11, 2007, at http://www.economist.com /world/africa/displaystory.cfm?story_id=8534153. Ephraim Kam, “A Nuclear Iran: What Does it Mean, and What Can be Done,” Institute for National Strategic Studies Memorandum, No. 88, Tel AvivUniversity, February 2007. Patrick Clawson and Michael Eisenstadt (eds. ), “Deterring the Ayatollahs: Complications in Applying Cold War Strategy to Iran ,” Policy Focus, No. 72, The Washington Institute for Near East Policy, July 2007. “Top Iranian Official Ahmad Khatami: Israel and the US Should Fear the Day Our MissilesLand in the Heart of Tel Aviv,” MEMRI, Clip No. 1238, Aug. 15, 2006. Times of London, November 8, 2007.